Zante's Very Own Geordie club! 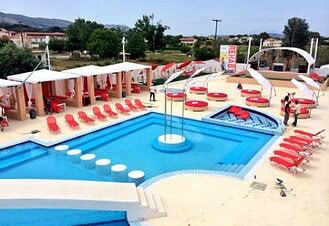 - Pure Nightclub / Pure Bar / Pure BeachClub Zante hit the shores back in 2014! Pure is a joint venture with Gaz from Geordie Shore, Cherry Bay and Linekers Zante and has had awesome visitors like Sigma, Sigala, Example and more over the years! We'll we'll keep an eye out for 2019 champagne spray parties as well!! See the best Zante events like Rum & Raybans Boat Party & Total Karnage here to get a taste! "Pure BeachClub and pool bar is bringing you something completely new to Zante, with private cabanas, luxury beds and sun loungers to relax enjoying some cocktails in the sun by day, and as the day moves forward we start to build up the tempo, with events that will blow your mind, from champagne parties to deep house sessions." Don't worry you can get your Free Zante events calendar straight to your phone below! Zante is insane - if you haven't been here before Zante has some of the most famous events in the world! Rum & Raybans Boat party, Total Karnage, The White Party - and now the cast of Geordie Shore lapping up the island! You've probably seen someone on twitter already who was out here while it was being filmed! Anyway don't miss out! Watch it! And get your Free Zante Events Calendar Below!! WOOO!! Give me my FREE A-Z Zante Guide inc Pure! Tickets to Pure events in Zante can be brought in resort - from Cabana beds, to general entry, its busy days are usually Tuesday & Saturday! Gaz was occasionally around over summer with MTV following closely behind but not so much these days - so you might be lucky but do't expect it! Pure fits in Well with Zante other great bars and even though not quite on the beach Pure has the feel that you're still 1000 miles from home - exactly what you want! Although it's called beach club - it's actually a little walk from the beach - if you want an actual club on the beach make sure to visit Republic with it's infinity pool!